We are already midway through January and finally, I’ve come up with my 2019 strategy. A lot has happened in 2018, and it’s the first time for a while that I’ve had some difficulties in establishing a plan for the year. So far, I have a brick-and-mortar business—i.e. 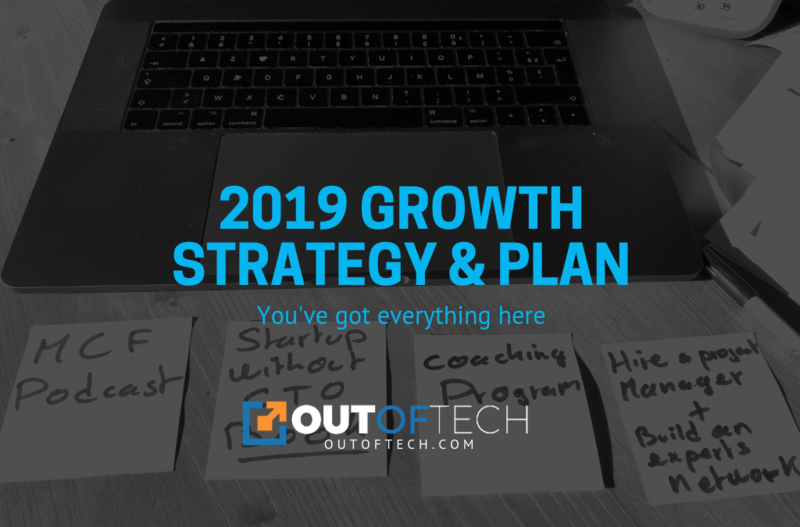 I went to clients’ offices, ran audit, coach their team, provide guidance, help them create a plan, etc.—a classical consulting business with fast-growing startups. But I don’t like doing the same thing again and again, and it’s been a while since I sought for a way to travel more while working. It was just last year when I introduced my coaching program to some clients, and it has changed everything in the way I plan my future now. So this 2019, I will be traveling more. I plan to leave France to visit new countries and spend more time in my childhood town. The world is so beautiful that my family and I are going to explore new opportunities to spend the next few years. Business-wise, the goal is to grow. But how do you grow when you are the only resource that produces the content, deliver value to clients, and has acquired a rare expertise where it’s almost impossible to hire someone similar? This is where I break down the roles that I perform for my clients. After a deeper analysis, I’ve identified 3 roles that I provide that startup founders look for in a CTO. This is actually the first reason why people contact me. They ask me to run an audit on their existing software, on their infrastructure, and come up with a action plan to handle the growth of the business. Basically, if you contact any good expert in one technology or another, that’s what you can expect: solving technical problems. But after doing this for as long as I have, I can tell you that that’s just the visible face of the iceberg. That’s what people want but rarely what they need first. The second role is the IT management coach. From small teams, to large teams with employees or freelancers, the efficiency of a team relies on its organization. Among my strengths have always been evaluating developers and CTOs, coaching them to become better at their work, structuring development, and optimizing the overall technical team productivity in order to have a better product. After the CEO, two of the most important roles in a startup are the CTO and the product owner. The product owner is the one in charge of building the roadmap. Usually, on the first stage, this is the founder himself, but most founders do not have the product management skills. A simple product manager will not do the a great job either when it comes to really innovating, injecting technology opportunities into the product, elaborating a new business model, and evaluating what’s possible and what isn’t possible and how complex it would be. What I recently realized is that working on hundreds of startup projects gave me a very broad knowledge of technologies used, of tactics to build products faster, and of the pros and cons of specific languages, frameworks and online tools. I am now more of an expert on doing what’s possible than on just scaling teams and infrastructures. The best meeting I ever had was when I helped define the roadmap of an up-and-coming startup, and it made me realize another thing. That this is completely related to what I’ve wanted to be as a child: an inventor! Here is what has become the most classical scenario to me. Someone new shares their idea and their vision with me. We brainstorm together. I twist, I tweak, I challenge that idea, and with the founder, we come up with several ideas that will become the different stages of the roadmap. My role is to contribute to the initial idea, to add the technical gold nuggets in creating an innovative product while being true to the founder’s vision. That’s what I do best and that’s where my focus will be in the future. Delegate the technical expertise. Just because I can’t be expert in everything, and even if I’m able to run an audit on source codes, infrastructures, etc., this is not where I add the most value. My value is in knowing what type of expert a startup needs and in finding someone with this skill set. If I want to scale, I need to delegate a part of my daily work. My focus is to keep growing with the current coaching program and get the help of a senior CTO manager. One of the most important skills is structuring the startup project and team organization. Obviously, I’m not the one doing this, and my goal is to be able to find someone who’s probably more of an expert in Agile organization, with an experience in growing team organizations, and who will be able coach the projects from this perspective. It was never my goal to become a innovation consultant. I consider not only helping people to innovate but contributing myself to the invention process, and this became possible because of the technical knowledge that I gained through the years and the experience of working with a larger number of startups. My goal now is to lead one, two, and someday maybe hundreds of senior managers to and truly become an innovator. Basically, reproduce the business model I created for myself on an even larger scale. OutOfTech blog posts I’m going to reduce the frequency of publishing these blog posts to one article a month from last year’s one article a week. I cannot do everything all at the same time. AskMyCTO videos I’ll keep producing weekly videos to help founders overcome their startup tech difficulties on their own. ‘The Startup Without a CTO’ book It’s been 3 years since I wrote several articles for my book. I’ve decided to finish it by the end of June and publish it in September 2019. MyCTOfriend podcast This is something that’s been in the back of my head for a while now. My goal is to launch this podcast before the end of the first quarter of 2019. Stay tuned 🙂. Online courses I was really productive on this last year. I will establish the ecosystem before coming back on this. The courses I already plan to do are on remote management and startup team management. Hiring my first senior manager I plan to make this person the first “innovation consultant” at MyCTOfriend by the end of the year. How it that possible for a single man to achieve this? My mentor Sagi: https://www.linkedin.com/in/sagishrieber/. We have a similar background as he’s also worked with many startups as an design expert and he’s managed to sell coaching and online courses to people worldwide even though English isn’t his mother tongue. My English coach and interviewer Mercedes: https://www.linkedin.com/in/ruiz-gil-mercedes/. Mercedes is the one who reviews almost every piece of content I produce—courses, videos, etc. She also interviews me and turns our discussion into a blog post for OutOfTech.com. My general virtual assistant Florence: https://www.linkedin.com/in/florencerodes/. Florence is a “Swiss Army knife” when it comes to recruiting, delegating, organizing and managing online marketing in general. We’ve been working together for almost three years now and we make a such great team. My coach Beatrice: https://www.linkedin.com/in/beamelin/. Beatrice has been coaching managers for decades. Knowing almost nothing about my business makes her more relevant than ever, enabling her to coach me on a deeper level to become the better version of myself. My membership program coach Nathalie: https://newsoftwaremarketing.com. Nathalie is THE expert in paid membership sites and coaching programs. She has helped dozens of entrepreneurs and well-known experts establish profitable online businesses around their expertise. She provides me the required insights and the tools to build an even better experience for my coaching clients. And more recently, I’ve started working with ServeBox: http://servebox.com to help me establish my business on a larger scale. ServeBox is an all-in-one innovation and software development company. I found in them the mirror effect required to help me make better decisions and establish MyCTOfriend as a sustainable company. Like I did last year, I’ll stick to monthly retrospectives and will keep sharing with you my progress here on the blog. In the meantime, know that I share them because I believe that innovation has to be challenged by others, and any thoughts, questions, comments or suggestions are more than welcome. Just reply to this email and tell me what you think. Until the next time, I wish you again the best year ever for 2019. Do let me know what your own goals are and I will see how I can help! P.S. Are you a startup founder inspired by what I do? Want to work with me? Just fill in this application form for my coaching program before January 31st, and join the latest group that will be launched next month: https://myctofriend.co/onlinectoprogram/.